ROCK HILL, S.C., May 17, 2018 — (PRNewswire) — Today, 3D Systems (NYSE: DDD) announced that Italian start-up Yndetech has added its 700th customer in just three years, producing high quality dental implants and other dental devices on its four ProX® DMP 100 3D metal printers. Yndetech, which was founded in 2015, acquired its first ProX DMP 100 shortly after it opened its doors in June of that year. "My partner, Francesco Grande, and I realized that the quality of the pieces we were seeing from the DMP 100 was absolutely outstanding. We shared these results with the dental technicians in the area and the feedback was very positive," said Emidio Cennerilli, president and CEO, Yndetech. Based on this initial input, Yndetech acquired a second ProX® DMP 100 soon afterwards. The quality and throughput of the 3D printers enabled Yndetech to provide its customers - predominantly dental technicians - with 24-hour turnaround service. In the next two years the company added two more ProX DMP 100 systems to keep up with growing demand. "Today we are printing a complete portfolio of dental devices with this laser melting technology using 3D Systems' cobalt-chrome material, including bridges, abutments, and implant bars," explained Emidio. "Cobalt-chrome has many advantages for dental applications such as biocompatibility, high wear resistance, easy to polish, chrome makes it more resistant to corrosion, and the very smooth surface finish makes it difficult for bacteria to attach to it." Yndetech is supported on-site by 3D Systems' channel partner 3DZ Italy. 3DZ provides deep application expertise together with technical support for all of Yndetech's ProX DMP 100 systems, while ensuring that materials are delivered on time to maintain high customer satisfaction. Yndetech has developed a 24-hour turnaround service based on the reliability of the ProX DMP 100. Dental technicians upload their dental CAD files to the Yndetech site or send them via email by 3:00pm. Using 3D Systems' Phenix dental software, the Yndetech operator nests the various devices for printing on the ProX DMP 100's plate. Within three hours, the files are ready to print overnight. The next morning, the parts undergo post-processing and are sent to customers by courier by 5:00pm. Fifty to sixty dental devices are produced this way each day. "Since I first became acquainted with Yndetech and their 3D Systems laser melting solution, I could no longer work without them. 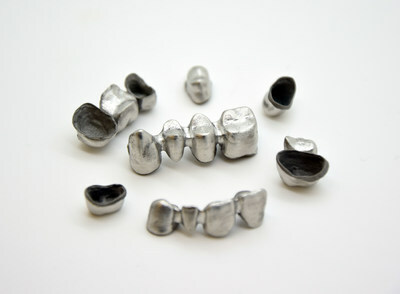 Compared to the other types of manufacturing processes and other milling centers, Yndetech has allowed me to produce dental elements with very high quality and precision - making my job easier and more accurate at the same time," said Graziano Bruni, Laboratorio Odontotecnico Bruni & Pellanera. "The cobalt-chrome implants with the easily–removed, thin support structures are my favorite, and competitively priced for the truly excellent quality we receive." As a result of the Yndetech's superior quality and processes, the company is certified for ISO 9001 and also ISO 13485 to manufacture medical and dental parts according to strict customer and regulatory requirements. "This level of certification is important to Yndetech's customers to give them the peace of mind that they are receiving the level of quality and service they expect for dental implants," said Emidio. "The quality of the parts in terms of the surface finish is the reason we were able to build this business so quickly. Another important factor is the price/performance ratio of the materials, which is quite attractive. The reaction from the Italian market has been so strong, now we are looking to expand our business to other countries." "We are pleased to see a young company like Yndetech succeed so rapidly in a competitive environment where absolute accuracy and predictability are expected," said Wayne Davey, General Manager, EMEA & India, 3D Systems. "Their success confirms the quality of our complete digital dentistry solutions, which include software, plastic and metal materials, 3D printers and on demand manufacturing – supported by the dedication and experience of our local channel partner 3DZ. We encourage all dental labs, clinics and service providers to compare the quality and precision of our regulatory-approved solutions for the complete range of dental applications." Yndetech will be displaying examples of its 3D printed dental implants at Expodental 2018 Rimini, Stand 7, Pavilion A3, May 17 – 19 in Rimini, Italy.